Want to start a business in Pakistan? & Don`t know where to start! 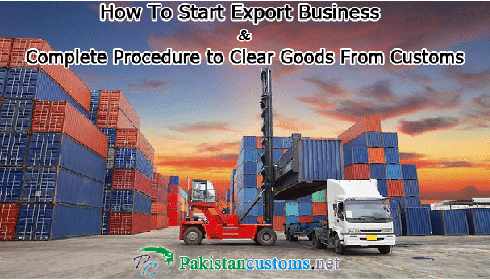 So don`t worry, we are here to help you, Start an export business in Pakistan is a challenging task, therefore we are trying to make this process simple with our knowledge but remember one thing Without “Kharcha Pani” doing business is impossible. Even you can’t register your company or get a Sales Tax Number without it. Q1: How To Export from Pakistan? Q2: How To Register Company Name in FBR? Q3: How To Obtain Weboc Id and Password? Ans: We have already discussed the complete procedure to get WeBoc id & password Click Here to Read. Q4: What is a Freight Forwarder & What They Do? Ans: A freight forwarder is a person who takes care of the important steps of shipping the merchandise. This person quotes shipping rates, provides routing information, and books on cargo space. Q5: What is a Clearing Agent & What They Do? If you appoint any clearing agent so your clearing agent will complete customs formality and release your container or shipment. Just add him to your WeBoc`s agent clearing list (How to add clearing agent in Weboc) using WeBoc id and provide him documents (i.e. Invoice, Packing List, Cro (Loading Program), Form-E). Q6: What Documents are Required for Export Customs Clearance? Ans: Below provide the complete list of document required at the time of export customs clearing. Q7: How To File Export Gd (Goods Declaration) in Weboc System? Q8: How To Clear Goods From Customs ? or How To Clear Export Customs Examination? Ans: We have already written complete process of clearance goods from customs in details so Click Here to read it. Q9: How To Clear ANF Examination? if there is anything that you did n’t understand about this post and ask something so please comment below without any hesitation I will be happy to help you and don’t forget to share it if you think it’s useful, God bless you! How to clear goods from customs. Average time to clear exports through customs. Complete Procedure to Clear Goods From Customs.